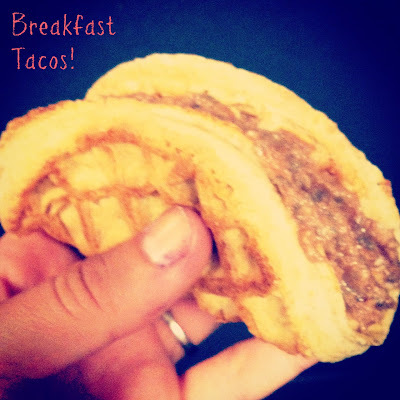 Just Keep Sweating: Breakfast Tacos! Long weekends really mess with my head. They throw me off schedule, which leads to destruction. For example I didn't food shop for myself this week. I'm not sure what I was thinking when I was food shopping, but apparently it had nothing to do with needing to eat for 5 days. Fast forward to yesterday morning at 7 am. What the heck am I taking to work for breakfast? It was protein packed which held me all morning. Unfortunately I don't think we'll be seeing this at Taco Bell anytime soon..
For double the protein make a protein waffle, either Van's or homemade. Okay now that I'm done with you go make these, you won't be sorry. what a fun idea!!! i love to put nut butter on waffles, but im totally trying this now! spa love! those look really good. must put waffles on the grocery list. 1 "lonely" waffle. Love it. and I LOVE the idea of this recipe. I have some frozen Vans in my freezer. Should try this soon! Yummy! What a way to turn 1 lonely waffle into something amazing!!! I cant... all this does is really make me want a taco. LOL. How about I eat a nice taco with some cheese, fresh avocado, garden salsa and ground turkey then run a few extra miles? deal? Great idea! Long weekends do the same thing to me - awesome solution!